Saqqara, also spelled Sakkara or Saccara, is a vast, ancient burial ground in Egypt, serving as the necropolis for the Ancient Egyptian capital, Memphis. Saqqara features numerous pyramids, including the world famous Step pyramid of Djoser, sometimes referred to as the Step Tomb due to its rectangular base, as well as a number of mastabas (Arabic word meaning ‘bench’). The pyramid was built during the 27th century BC by Djoser’s vizier Imhotep. Saqqara is inscribed on UNESCO’s World Heritage list as part of Memphis and its Necropolis – the Pyramid Fields from Giza to Dahshur. I just love camels! They’re so photogenic, don’t you think? 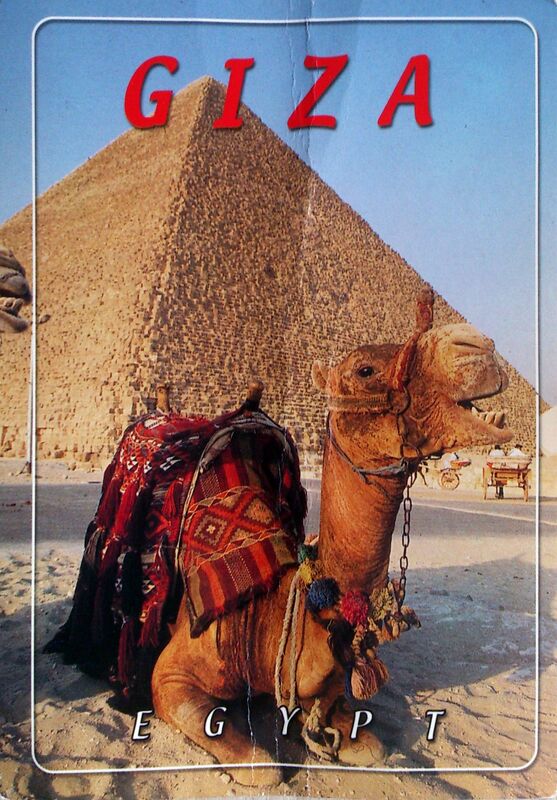 This particular camel card comes from Mohamed. This extremely cheerful camel is posing in front of a the Great Pyramid of Giza (also known as the Pyramid of Khufu or the Pyramid of Cheops). It is the oldest and largest of the three pyramids in the Giza Necropolis. It is the oldest of the Seven Wonders of the Ancient World, and the only one to remain largely intact. Based on a mark in an interior chamber naming the work gang and a reference to fourth dynasty Egyptian Pharaoh Khufu, Egyptologists believe that the pyramid was built as a tomb over a 10 to 20-year period concluding around 2560 BC. 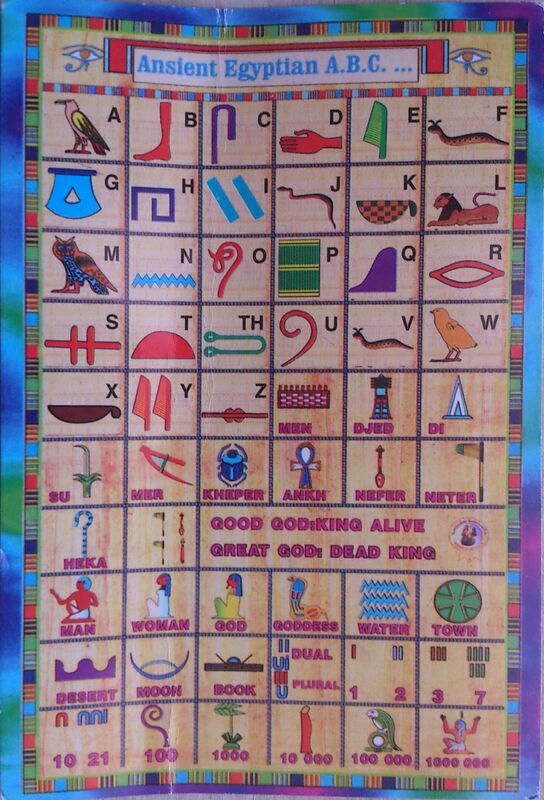 There were no vowels in Egyptian Hieroglyphs, only consonants. Hieroglyphs were not just written on tablets and temple walls they also used papyrus reed. The reeds were flattened, dried, and stuck together to make pages. The majority of the people in Ancient Egypt did not read or write. The scribes and priests were the ones who did all the writing. Egyptian hieroglyphs could be written in both directions – right to left or left to right. The Rosetta Stone was discovered by the French in 1799, and was instrumental in cracking hieroglyphs. The stone contained passages written in Middle Egyptian, Demotic and Greek and in the 1820s French historian Jean-Francois Champollion finally translated and cracked Egyptian hieroglyphs!